It has two kiddie pools and another for adults that are with roofs which protect swimmers from direct sunlight. Bathers enjoy the water even during the hot noon and afternoon sun. “Not only for having roofed swimming pools, the water in our swimming pool is also clean and fresh,” resort supervisor Jason Dilig said. Dilig is one of the children of Amanda Dilig, owner of Villa Amanda, who personally supervises all areas of the resort “to see that visitors are safe and enjoying". ”Lifeguards are on tight watch over swimmers. Entrance fee is P80 for adults, P70 for children. Picnic huts are available for P200 – P300. 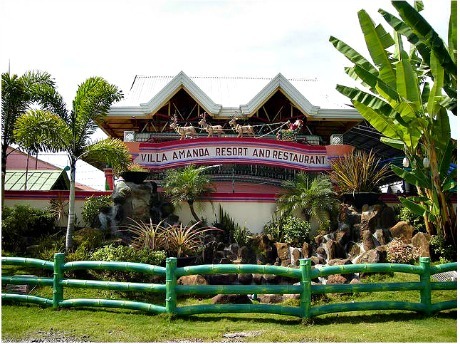 The resort that lies adjacent to the MacArthur Highway is accessible to passenger jeepneys and tricycles. It is open from 8 a.m. to 8 p.m.
“We also have a restaurant that serves the best 'pesang tilapia', “inihaw na tilapia” and other cuisines at reasonable and affordable price,” Dilig said. Tilapia for sure is fresh and clean, being raised in ponds right in the resort. “We are coming over here for fresh air,” said Aida Santos of Barangay Lamao, Limay, Bataan. She was with a big number of relatives. At the back of the resort is a mini-zoo where children love to roam around.